If you have been following Toddler Approved for awhile, you know that my five year old son has been obsessed with volcanoes since he was a toddler. My two-year-old daughter has jumped on board the volcano train too and thinks they are pretty awesome. When I discovered that ALEX toys had a 3D dinoland puzzle that also features a volcano, we knew that we needed to check it out! 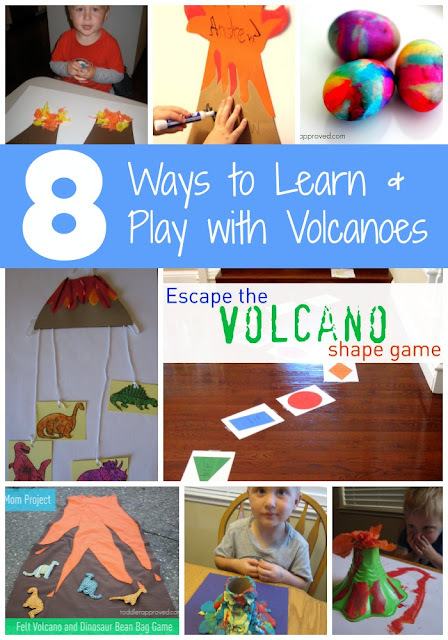 Today I am seriously SO EXCITED to share this fun 3D Dinoland puzzle with you along with eight of our favorite ways to learn and play with volcanoes. When the dinoland box arrived from ALEX toys, there definitely was some screaming and jumping going on in our kitchen! 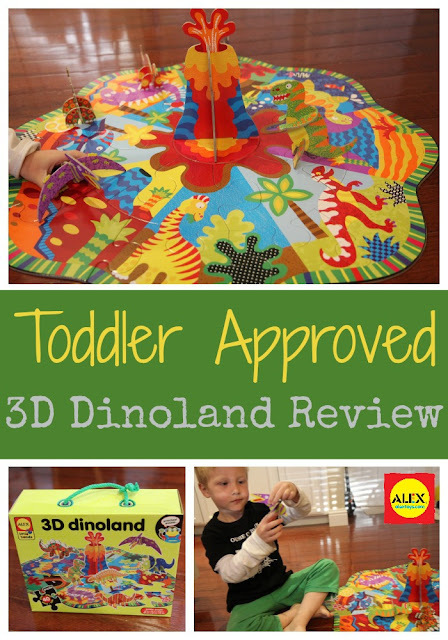 Six colorful and sturdy 3D dinosaurs that can be easily put together! 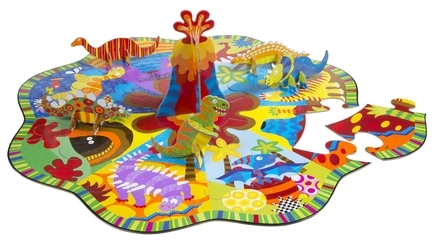 a huge colorful 40 piece dinoland puzzle that includes a 3D volcano that stands up in the center (The puzzle measures 27" X 27" X 8.35" high). WOW! This is awesome (my five year old's opinion)! Meanwhile my toddler was so occupied flying the dinosaurs around and having them explore the playland that she was speechless. The puzzle has different unique colorful sections which makes it pretty easy for kids to put it together without much adult help. It is for kids ages 3+ so little toddlers will need help. It worked best when we build it on a hard, flat surface. The pieces were large and easy for little hands to manipulate. Our absolute favorite part of the puzzle was that once it was put together, we could play with it! Typically putting the puzzle together is the activity. With this playland, putting the puzzle together was only half the fun. The kids had such a great time using the 3D dinosaurs for some dinosaur imaginative play time together. They created stories with the dinosaurs and had them talk with one another. They even used the dinosaurs around the house for other activities! My toddler loved the dinosaurs so much that they accompanied her to watch a movie, get dressed, and play along with some of her other toy friends. We loved counting the dinosaurs on the playmat and the 3D dinosaurs and talking about the colors and designs on the mat as well! The vibrant colors made the mat so enticing! Once the kids were done playing with the 3D dinoland, the pieces easily fit back inside the compact dinoland box and could be stored away quickly. We had to make sure that we kept it close by though, since the kids liked pulling it out often! I also discovered that ALEX has a 3D fairyland and a 3D cityscape for kids who like a different, less explosive play scene. Do your kids love puzzles or volcanoes or dinosaurs? Do you have any other favorite ALEX toys at your house? Thanks to ALEX Toys for sharing this fun product with us! If you are interested in exploring some of the other toys that they make, head on over to their website. You can also connect with ALEX on Pinterest and Facebook to hear more about their products and other creative ideas. "It all begins with a brushstroke... it all begins with ALEX"
Disclaimer: The products shared in this post were given to me for free to review by our friends at ALEX Toys. The opinions expressed in this post are mine. What a neat puzzle! I may have to get one for my cousins! Love the 3D puzzle! My daughter would love the 3D fairy land! I have two Volcano posts! What a wonderful puzzle! We have so birthday parties coming up for friends. This would be a great gift.